Baltic Lashes® volume technique is an advanced technique of 2 to 5 especially thin diameter extensions forming a set of 200 to 500 eyelashes per eye. This creates an impressive look and gives the fullness, density of eyelashes for your clients. Experienced artists who want to improve their skills and qualification of eyelash extensions. We noticed that our basic course is so intense that students with different certification can join this class and learn much more than in previous trainings. Allergies to tiny products; Adhesives and solvents; Fever; Contagious or infectious diseases; Drugs / Alcohol; Diarrhea and vomiting; Any know allergies; Eczema; Undiagnosed lumps and bumps; Inflammation; Cuts; Bruises; Abrasions; Sinusitis; Migraine or headache; Hypersensitive skin; Botox and dermal fillers (one week following treatment); Skin allergies. 1.1 What is eyelash extension and who can wear them? 1.2 Who can do the treatment? 6.3. What are the main effects of good adhesive drying? Student will received certification of masterclass attendance. After the course best students can get Baltic Lashes Artist logo. Moreover, you will be able to continue on further certification awards – Specialist, Perfectionist, even to become Master or Virtuoso ! Continuous support (6 months trainer support). You can improve your career with professional knowledge. During the learning process, we will provide all necessary tools and materials. 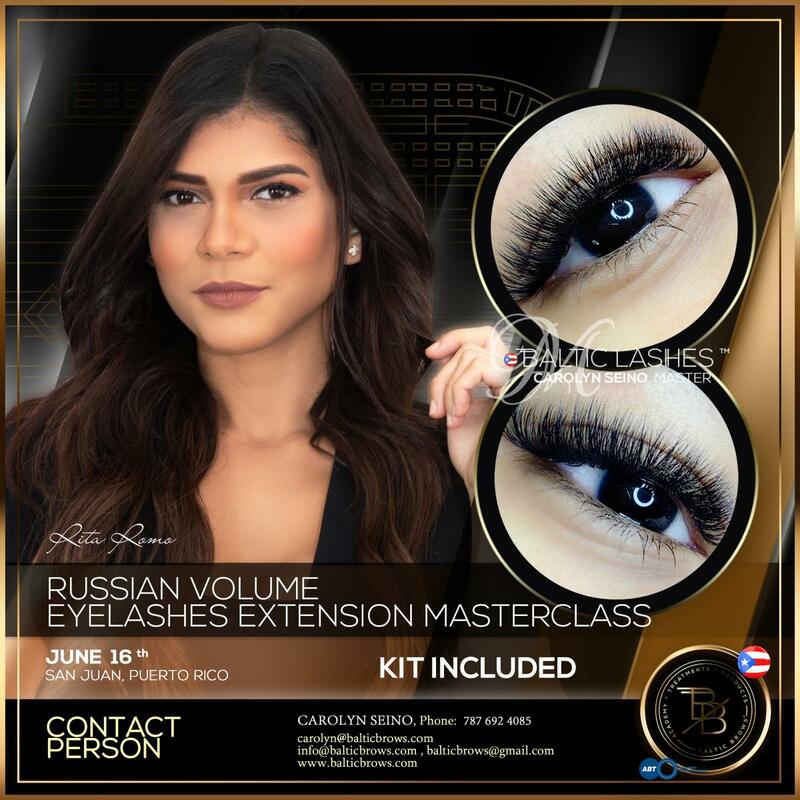 Do I have to be already trained to study russian volume eyelash extension training? - Yes, you need to have previous experience in eyelash extension. - Yes, class comes with a kit. What tools and products are used for eyelash extension? - Special eyelashes for extensions, special glue, tweezers, cleanser foaming, gel – free pads and some other equipment to make sure the treatment is done hygienically. - The duration depends on technician but usually it is 2-2,5 hours. All registration goes through balticbrows.com platform. Choose the certain class and pay the deposit. Deposit is NON REFUNDABLE.